Brian Williams has been suspended, and the "NBC Nightly News with Brian Williams" is now officially just the "NBC Nightly News." But the crisis fallout is just beginning for NBC. The network is continuing to comb through past news reports and public appearances by Williams, looking for examples of misstatements. NBC's attorneys are involved. Morale at the news division -- which wasn't high to begin with -- has been dragged down by the week-long controversy over Williams' recollections of an Iraq War mission in 2003. Some staff members have lost confidence in NBC management to navigate through the crisis. Meantime, there are widespread doubts that Williams will be able to recover. Joe Scarborough said so Wednesday on MSNBC, the cable news channel owned by NBC: "Six months without pay leads a lot of people in this building to ask whether Brian will ever come back." But Williams is determined to try. He is eager to apologize to viewers again, more thoroughly and profusely this time, according to two people close to him. On Wednesday night, the first edition of Williams' newscast since the suspension was announced, his name was missing from the graphical introduction. Substitute anchor Lester Holt explained what had happened and called it "an enormously difficult story to report." 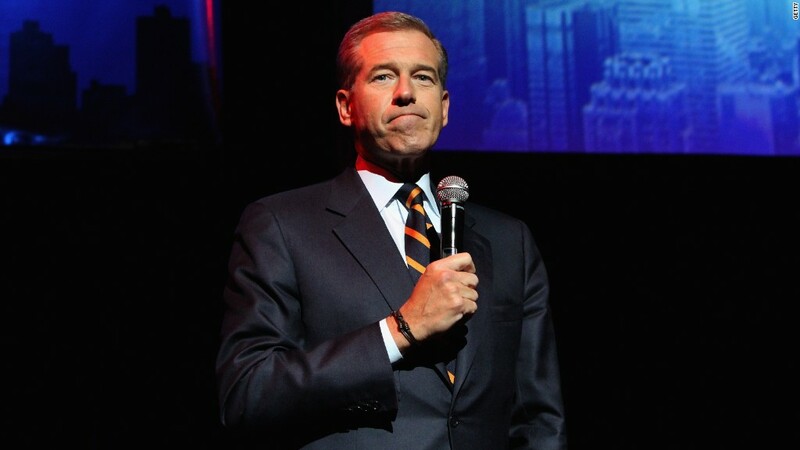 Williams was, until this week, the country's highest-rated news anchor. He is said to believe that he can stage a comeback and earn the "second chance" that NBCUniversal CEO Steve Burke mentioned in Tuesday's announcement about the unprecedented six-month suspension without pay. One of the people close to the anchor pointed out that he could have resigned on Monday or Tuesday if he had wanted to throw in the towel. Instead, he accepted Burke's suspension and hunkered down for a long period out of public view. What some would call determination by Williams, others would call denial about the severity of the situation. "I think it's going to be pretty hard to turn the clock back to anything like the traditional credibility that he had as a news anchor," Mark Feldstein, a former CNN correspondent who is now a broadcast journalism professor at the University of Maryland, said on CNN on Wednesday. Observers like Feldstein read Tuesday's memo from Deborah Turness, the president of NBC News, to mean that the network may have uncovered other embarrassing examples of puffery or even outright lying by Williams. "We have concerns about comments that occurred outside NBC News while Brian was talking about his experiences in the field," Turness said. NBC officials declined to elaborate on Wednesday, citing the ongoing fact-checking process. Meanwhile, inside the halls of 30 Rock, Turness tried to restore confidence through a series of staff meetings. She answered questions and listened to feedback -- some of it quite angry -- throughout the day on Wednesday, according to an NBC source. What's at stake is not just Williams' credibility or her credibility, but to some extent the trustworthiness of the entire news division, which has a storied history thanks to stars like Chet Huntley, David Brinkley, Tom Brokaw, Tim Russert, Katie Couric, and Matt Lauer. There's a lot to celebrate about its past, but not as much about its present. NBC News enjoyed a winning streak in the late 1990s and throughout the 2000s that made it the envy of the television news industry. For years, its morning show "Today," its nightly newscast and its Sunday morning public affairs program "Meet the Press" were all No. 1 in the ratings. But now the network is mired in second place in the mornings, the profit center for the news division. The news division is hurting at other times of the day, too. It has made changes that have cost millions, like the ouster of David Gregory from "Meet the Press" last fall. Chuck Todd is now getting settled in to the moderator chair there. It is also paying out the contract of Jamie Horowitz, the ESPN producer who was placed in charge of the "Today" show a few months ago, then promptly fired. On the air, NBC is trying to rehabilitate Dr. Nancy Snyderman, who violated an Ebola quarantine after returning from a reporting trip in Africa. And it is trying to avoid any more journalistic blunders -- some of which are chronicled here. Turness, who hails from Britain and took over NBC News about a year and a half ago, "has found herself dealing with one calamity after another," one of the British newspapers that has covered her for years, The Independent, wrote on Monday. Both Turness and her boss, Pat Fili-Krushel, the chair of the NBCUniversal News Group, are likely to face further scrutiny in the days and weeks to come. Why did they allow Williams to read an apology last Wednesday that was almost universally deemed insufficient? As questions piled up, why did they opt for an internal investigation rather than hire someone externally to do it? Some media analysts have openly asked if Turness will survive this current crisis. Ultimately she and the other bosses have to protect the news division, even at Williams' expense. That tension was evident on NBC's "Today" show, which covered the controversy for the first time on Wednesday morning. "Brian is not only a colleague of ours here, but he's a really good friend," co-host Matt Lauer said. "We all care a lot about Brian," co-host Savannah Guthrie added. "That's what makes this so hard." Then she quickly added: "We also care a lot about this place. The standards of NBC News. And that's what NBC is trying to balance here." Then Lauer and Guthrie expressed their thanks to Holt. On Tuesday -- Holt's second night as sub -- NBC bested its main rival, ABC's "World News Tonight with David Muir," in all the key ratings categories, according to preliminary Nielsen numbers. The results suggest that viewers -- even if they're fans of Williams who want him back -- are not rejecting Holt in the chair.